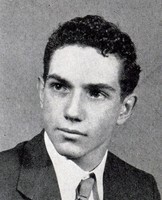 Anthony "Tony" F. Cosenzo, Se., 66 of Alpha, died Saturday, July 17, 2004 in Warren Hospital. Born: January 11, 1938, in Martin's Creek, Pa., a son of the late Luigi and Rosa Buonaventura Cosenza. Personal: He and his wife, Elaine M. Seip, were married for 37 years. He was employed as a machine assembler by Bell and Howell, in Allentown. He retired in 2001, after many years. Previous to that, he was employed by Taylor-Warton, in Easton. He will be remembered as a loving husband, father, grandfather, brother, uncle, friend, and for his love of hunting, fishing, and laughter. Membership: Anthony was a member of St. Mary's Catholic Church in Alpha. He was also a member of Citizen's Hose Fire Co., in Easton and Saftey First Fire Co., in West Easton. Survivors: his wife; four children, Gina Burd of Phillipsburg, Maria kish, of Riegelsville, Anthony Cosenzo, Jr., of Bethlehem, and Denise Barreiros, of Parlin, N.J.; one brother, Joseph "Pippy" Cosenza, of Easton, three sisters, Filomena Mendolera, of Streeraboro, Ohio, Lucy Brooks and Lisa Kuhn, both of Easton; five grandchildren, Caden Kish, Conor Kish, Patience Burd, Indiana Burd, and Cassandra Cosenzo. Anthony is predeceased by two brothers, both named John Cosenzo. Services: Tuesday, 8:30 a.m. in Finegan Funeral Home, 2nd. Avenue and Warren Street, Alpha. Mass of Christian Burial in St. Mary's Catholic Church, 5th Avenue, Alpha, at 9 a.m. Viewing hours will be Monday (tonight), 7 to 9 p.m., in the funeral home. Interment will be in Three Church Hill Cemetery in Martin Creek, Pa.